It all began in Bridgeport, CT almost a century ago when Henry C. Reid, a watch and clock maker, opened the store in 1910 on Broad Street. When Herb Reid, the son of Henry C. Reid, retired, his partner Arthur R. French Jr. took on three new partners, all of whom had been in his employ. Harry French bought out his father’s partners in 1978 and today the certified gemologist remains the sole owner and company president of Henry C. Reid & Son Jewelers..Not only has French followed in his father’s footsteps, but in those of Herb Reid. Reid was among the first jewelers in country to become a certified gemologist by the American Gemological Society. 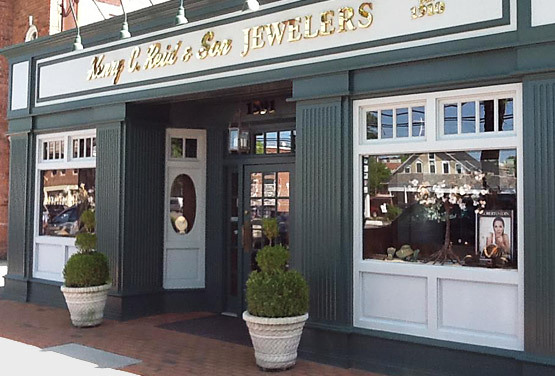 Under the management of the Reids and Arthur French, the fine jewelry and gift store flourished for decades. In 1975 a second store was opened in Fairfield’s Heritage Square. Several years later the Bridgeport store was closed and the entire business was moved to the Fairfield location. But shortly thereafter they left Heritage Square for a place on the Post Road. The business remained there for almost 20 years before moving one year ago to its present location at 1591 Post Road, just six doors away. And with the move, Henry C. Reid & Son Jewelers has started a new chapter in its illustrious history.